The Toro TimeCutter SWX5050 is a hydrostatic zero-turn tractor powered by a 24.5 HP at 3,600 RPMs Toro engine 708cc. It has a 50 in. 3-bladed mowing system under a 4 in. deep, top discharge deck with convenient washout ports. The mower boasts 7 cutting positions between 1-1/2 in. and 4-1/2 in. height. Its Smart Park braking system automatically stops the mower deck and sets the parking brake when you get off the mower all while keeping your engine running for added convenience and ease of use. The Key Choice feature allows you to prevent others from mowing in reverse by simply removing a key. It has dual heavy duty ZT-2800 transmissions powering 20 in. Dia rear tires for a smooth ride. Further maximizing comfort, it comes with an 18 in. tall thickly-padded premium seat with armrests. It is equipped with an electric PTO. An hour meter comes standard. A hitch comes standard for pulling Brinly- hardy attachments. It also has a tilting steering column which maximizes comfort for all operators. 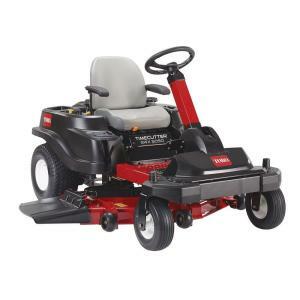 Tbook.com crawls the web to find the best prices and availability on Toro and related Tools and Hardware products like Toro TimeCutter SWX5050 50 inch Fab 24.5 HP V-Twin Zero-Turn Riding Mower with Smart Park. For this page, related items include products we find that match the following keywords: "Toro" at our vendor partner Home Depot. Toro TimeCutter SWX5050 50 inch Fab 24.5 HP V-Twin Zero-Turn Riding Mower with Smart Park is one of 157 Toro and related products listed in the Tools and Hardware section of Tbook.com If you have any questions on this product, please give us a call at 734-971-1210 during the hours of 9am - 5pm EST for assistance. Thank you for shopping at Tbook.com, the Internet Department Store!